There are many small garden plans out there on the internet today. There are also countless books that have been printed over the decades related to this topic. The truth is when I first started gardening, I looked for plans myself and was surprised to find how difficult it was to weed through all the information. In this article we'll see if we can't simplify some of the ideas. Containers & Small Garden Plans: Containers actually are a great solution for growers who just want to grow a few plants and don't have the need for a dedicated vegetable garden. I've listened to quite a few vegetable gardeners say that containers just are not practical, or that you can't get good results from vegetables grown in them. I couldn't disagree more! While I enjoy gardening, I'm not a big fan of growing vegetables. It's not that I have anything against vegetables; I just don't get the same satisfaction out of growing them as I do flowers and other plants. Now that said, I do like to have fresh tomatoes and peppers around the house as we use those often (and tomatoes and peppers tend to get expensive in our area). I'm not willing to give up any of my yard to vegetables so I will frequently plant them in large decorative containers and simply make them a part of the landscaping. I've grown tomatoes in 7 to 10 gallon containers with wire supports and they come out great! While I'm not a big fan of those novelty gifts (that I won't name) that hang your tomatoes from a cheap basket upside down, I have made my own using cheap 5 gallon pails from the hardware store and I've had great results with those. Those are great for small vegetable garden plans! I prefer to grow tomatoes in larger pots on the ground because I think they just get fuller, but peppers seem to do extremely well hanging upside down. We make a lot of stuffed peppers around our house and the peppers seem to grow to just the right size from the hanging pail, I love them! If you have the space and the willingness to give up part of your yard strictly for vegetables, there are some great small garden plans that you can use with amazing results. I'm a big fan of the idea behind square foot gardening where you designate a 4 foot by 4 foot raised garden box and divide it out into 12 inch parcels separated by wood slats. Each 12 inch parcel is the dedicated to a single plant or vegetable, in whatever quantity will fit comfortably into that space. 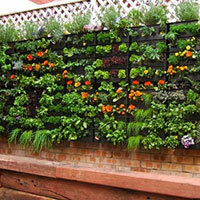 The concept itself is ingenious and there are many benefits to gardening that way. If you would like more information on square foot gardening, use our search bar at the top and you will find articles detailing the process. Companion Planting: If you are like me and you just don't have the space (or willingness) to dedicate a portion of your gardens to vegetables, you can also considering companion planting in your small vegetable garden plans. Companion planting is the practice of combining plants that complement one another into a single growing area, so that they can be mutually beneficial to one another. One example is called the Three Sisters Garden which dates back to ancient times and combines corn, squash, and beans in a single growing area, typically a small rounded hill of fertile soil. In the center of the mound is the oldest "sister", the corn who stands tall. The next sister is the squash which will grow out across the entire mound, protecting the other sisters from any weeds that might grow. The squash plants will also provide shade for the mound and help keep it cool and wet. The third and final sister is the beans. The beans will grow up through the squash plants and cling to the stalks of corn. Beans are essential to keeping the soil fertile because they convert the sun's rays into nitrogen that is stored in nodules on its roots. The nitrogen is then used as food as the beans grow. This is a great example of small garden plans that are still in use today. 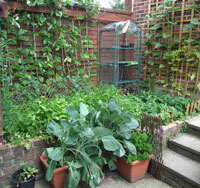 If you would like additional information on companion vegetable planting, look at our section on Vegetable Gardens! 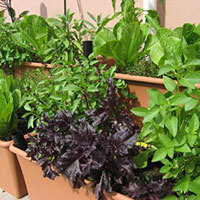 Vegetables can really be grown in just about any location that has adequate sunlight. You really don't want to try growing vegetables anywhere where you do not have at least 6 to 8 hours of consistent sunlight per day. Even partial shaded areas do not typically work well for vegetables. If you don't have an ideal location for your small vegetable garden plans, and don't worry you are not alone there, a north or south facing location will lend itself well provided that you don't have structures or trees that cast long shadows across your vegetables. Most people have flower gardens around their homes, some on all sides. If you are one of those, pick the one that faces the sun for most of the day and you can designate a few small areas for vegetables there too. 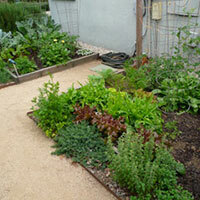 A lot of people have very productive vegetables gardens that are done on a small scale. The trick is coming up with small vegetable garden plans that not only work for you, but also the space that you have to work with. 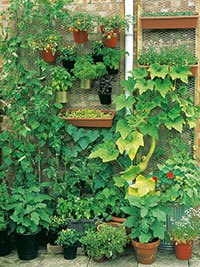 All it takes is a little ingenuity and you can turn a small space into a productive vegetable garden!